The shingled house with sweeping porch sits at the end of an oystershell drive and is screened from the road by a stand of old, native pines. The porch is a cool, shady respite on a hot summer day. 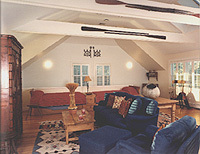 The bunkroom, over the garage, served the two college age sons and their friends well. The room, sleeping six, with a bath and small kitchenette, became the favorite summer hangout for the boys. 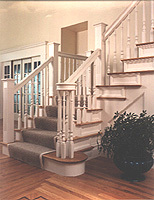 The stairs separate the living room from the entrance foyer. 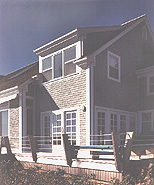 The overlapping treads are typical of New England style construction dating back to the 18th century. The library is closed off with glazed sliding doors to allow for some privacy. The kitchen is big enough for a whole family to cook in along with a few kibitzers hanging out in the breakfast nook. The free standing range and internally lit hood make it easy to to show off one’s cooking prowess. The kitchen opens to the formal dining room which is closed off from the great room with glue-chip glazed sliding pocket doors. Separate doors connect the kitchen to the garage and to the dining deck. The outside east facing dining deck, off the kitchen, is a wonderful area for early morning breakfasts and a shady spot for afternoon snacks and an early barbeque. 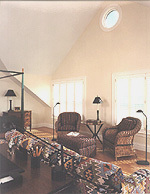 Rather than installing a low ceiling with an attic so typical of New England houses, we chose to open the rafters to the roof giving the master bedroom a wonderfully light and airy feel. Hardwood floors throughout the house are livened up with colorful throw rugs. 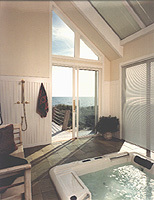 One of the most cheerful and cozy rooms in the house, particularly on a stormy day, is the spa. Sand colored slate floors, wood paneling and windows all around give the impression of being outdoors on a deck, except…. the spa water is warm even when it’s storming outside.